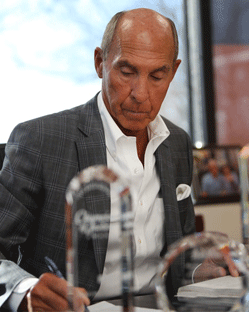 Senior and Founding Partner of Richard S. Victor, PLLC, Richard S. Victor, has practiced law since 1975. He has authored many nationally published articles on Family Law, as well as co-authoring two books: Michigan Family Law and Practice, a three volume treatise on family law; and You and Me Make Three, a children’s book regarding divorce, which was the recipient of several national book awards. He has been a faculty member or guest lecturer at Colleges, Universities, Symposiums, Law Schools, and Bar Associations around the United States and Canada. 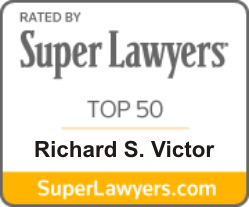 Richard is listed as a Diplomate of the American College of Family Trial Lawyers and listed in Best Lawyers in America; and has been named a Super Lawyer by Michigan Super Lawyers Magazine every year, since its inception and was featured on the cover of Super Lawyers publication with a special feature story in 2008. He has served as President of the Michigan chapter of the American Academy of Matrimonial Lawyers and was elected to the National Board of Governors of the Academy, receiving its coveted National Fellow of the Year award in 2006. He was elected Chairperson of the Family Law Section of the State Bar of Michigan and received its highest honor, the Lifetime Achievement Award. In 2000 upon his 25th anniversary from graduating Michigan State University College of Law he was honored with the National Alumni of the Year Award. In 2004 the State Bar of Michigan presented him with one of its most prestigious awards, the Champion Of Justice Award, honoring him for his work on behalf of families and children. He was named as one of the top ten lawyers in Michigan by Michigan Lawyers Weekly and was awarded the Meritorious Service to the Children of America Award by the National Council of Juvenile and Family Court Judges. Richard is the national founder and has served, pro bono as the Executive Director of the national nonprofit Grandparents Rights Organization, since 1982. He also founded the national nonprofit Victor Smile Foundation, providing benefits to children of divorce. 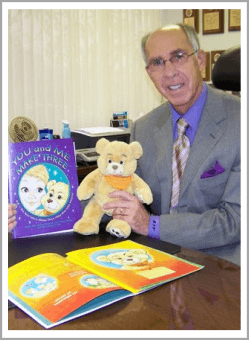 He, along with Judge Edward Sosnick of the Oakland County Family Court, created the SMILE (Start Making It Livable for Everyone) program (an educational program for divorcing parents) for both the state of Michigan and around the United States, as well as for the country of Australia. Richard believes and has taught both Lawyers and Judges that divorcing couples must realize that divorce is an emotionally draining experience, born from loss, which usually does not allow individuals to think and act logically and emotionally at the same time. By creating the concept of a more honest, personalized and direct way to practice family law, Richard has instilled a new philosophy to bring integrity to the practice of family law. Richard believes that lawyers who practice family law should have a higher duty to their clients then in other areas of law. He knows that the work he does will not only affect his clients and their business and their financial interests, but will most probably affect their children and future generations of their family. Richard and the work he has done have been featured on numerous state and national television and radio programs throughout the country, as well as three movies during his career. Recognized in "The Best Lawyers in America"
Named as a Michigan Super Lawyer by "Super Lawyers Magazine"
Named one of the "Top Ten Lawyers of the Year" in the State of Michigan for 1999 by Michigan Lawyers Weekly. Recipient of the Lifetime Achievement Award from the State Bar of Michigan Family Law Section (1999). Recipient of the Distinguished Alumni Award from the National Alumni Association of Michigan State University College of Law, 2000. Recipient "Meritorious Service to the Children of America Award" - National Council of Juvenile and Family Court Judges, 1993. Recipient "Distinguished Service Award" Oakland County Bar Association, 1994. Named to Oakland County Domestic Relations Task Force - Author of Attorney Code of Conduct (2001). President, Michigan Chapter American Academy of Matrimonial Lawyers, 2003-2004. Recipient of the 2004 "Champion Of Justice" Award, from the State Bar Of Michigan. Recipient of the 2005 "Respect For Law" Award, from the Bloomfield Hills Optimist Club. National Chairperson for Continuing Legal Education, American Academy of Matrimonial Lawyers, 2004 – 2007. National Board Of Governors, American Academy of Matrimonial Lawyers, 2004-2007. Named to "Who’s Who In American Law". Named to "Who’s Who In The World"
Co-Founder State and National SMILE Parent Education Program. Author and General Editor of Michigan Family Law and Practice, West Publications three volume treatise on family law. Published in The Law Review of Michigan State University Detroit College of Law, 2000. Guest Lecturer and Commentator for Emory Law Review and Emory Law School's Thrower Symposium on "Family Law in the 21st Century", 2005. Presentation at Michigan State University College of Law "New Frontiers in Family Law". Faculty Member 1975 through 1992 Oakland University, Rochester, MI, Author and Instructor in Family Law. Law School Guest Lecturer on Family Law and Child Custody: Emory Law School, University of Michigan Law School, Michigan State University College of Law, the Detroit College of Law, Wayne State University Law School, and University of Detroit Law School. Guest Lecturer for Institute for Continuing Legal Education; Family Law Section State Bar of Michigan; American Academy of Matrimonial Lawyers; and American Bar Association. Member of National Advisory Council of Hear My Voice Children's Rights Group. Sustaining member of the Oakland County Bar Association; Chair of Lawyers Admission Committee (1981); Chair of Unauthorized Practice of Law Committee (1982); Chair of Old-timer Night Holiday Dinner (1984 and 1985); Chair Speakers Bureau (1985). Participant in OCBA Bench/Bar Conference, 2001-2005. “Protecting the Children of Divorce Via Parent Education”, 13 Michigan Lawyers Weekly 1352, July 19, 1999. “Grandparent Visitation Laws Are Constitutional According to Justices”, Oakland County Legal News, June 30, 2000. “Court Examines Grandparent Visitation Law’s Validity”, Oakland County Legal News, Volume 75, Number 42, October 18, 2002. "Is the Presumption of Joint and Equal Custody/Parenting Time Best for Children? ", Michigan Bar Journal, February 2014. "Promoting Professionalism through better Communication", Oakland County Legal News. March 20, 2015. "Oprah Winfrey Show"; NBC "Today Show"; ABC “Good Morning America”; CBS ”The Early Show”; PBS "Late Night America"; NBC "Trial Watch"; CBS "Night Watch"; ABC "Special Reports with Joan London"; CBS "Nightly News with Dan Rather"; CNN "Crossfire";CNN Burden Of Proof”; Fox “Dayside with Linda Vester”; CNN News Programs; "Jerry Springer Show"; "Larry King Radio Program"; Legal Advisor for "Good Afternoon Detroit"; Several guest appearances "Kelly & Company" - "Company"; On Air Family Law Advisor/Consultant Network and Local News Programs including ABC, CBS, NBC, WKBD; WKBD "Straight Talk"; CNN "Impact"; Family Law Advisor/Consultant and Guest Host "Ask the Lawyer" WXYT Radio 1985 through 1993; On-air Legal Analyst/Consultant/Advisor,“Good Afternoon Detroit”, WXYT-TV (ABC Affiliate) 1982-85; Several MSNBC, CNN and FOX news show appearances. New York Times; Washington Post; Better Homes and Gardens; McCall's Magazine, Changing Times Magazine; Daily Tribune; Observer and Eccentric Newspapers; Parent Magazine; USA Today; Detroit Free Press; Detroit News; American Bar Association Journal; Family Circle Magazine; Oakland County Legal News; The Wall Street Journal; Michigan Lawyers Weekly; AARP Newsletter. 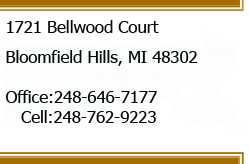 Amicus Curiae counsel for State Bar of Michigan Family Law Section, Tallman v Milton, 192 Mich App 606; 482 NW2d 187 (1992), which dealt with rights of foster parents to secure custody of children left in their care for extended periods of time. Co-Counsel for the Grandparents in DeRose v DeRose, Michigan Supreme Court, April, 2002, regarding the issue of whether Michigan’s Grandparent Visitation Statute is Constitutional. The Bare Assets Jazz Quartet, "Live at Latreille's," CD recording, June, 2000. The Bare Assets Jazz Quartet, "Lawyers Play Jazz Live," December, 2000.